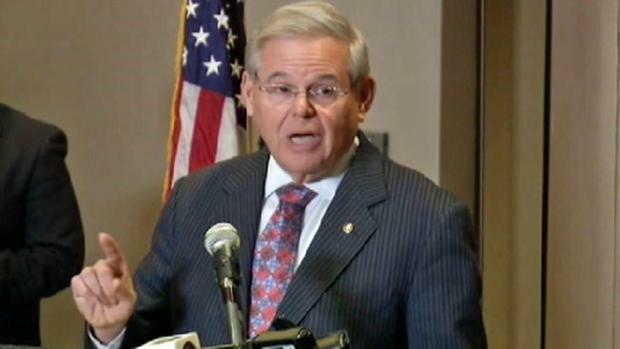 Federal charges could come as early as Wednesday in connection with the ongoing corruption investigation into U.S. Sen. Robert Menendez, a New Jersey Democrat, sources familiar with the probe tell NBC 4 New York. His campaign staff was preparing Tuesday night for the indictment, coordinating with the powerful Mercury Public Affairs firm to prepare a large number of statements of support from Democratic politicians statewide, NBC 4 New York has also learned. Menendez has been under criminal investigation in connection with his ties to Florida eye doctor Salomon Melgen. The senator has admitted he accepted free private plane trips from Melgen, including a 2008 trip to the luxury resort of Casa de Campo in the Dominican Republic. The senator has said he later repaid almost $70,000 for his trips on the doctor’s jet. Both Menendez and Melgen have denied any wrongdoing. Speaking with reporters earlier this month after an unrelated press conference, Menendez reiterated that he has done nothing wrong and bemoaned the leaks about the investigation in the press. "I'll say the same thing that I said two weeks ago when there was a different press report and that is that I have always acted appropriately and legally," Menendez said. A spokesman for Menendez, Steve Sandberg, told NBC 4 New York Tuesday night: "Since the illegal leak of three Fridays ago, the senator's staff and offices have been inundated with phone calls from individuals asking how they can help and show their support, for which the senator is appreciative." Spokesmen for the Justice Department and the FBI declined comment. One source told NBC 4 New York there will be a "considerable" number of statements, some ghostwritten, from politicians and organizations expressing support for Menendez as soon as the indictments are handed down. In one email shared with NBC 4 New York, a draft written for a politician quotes him as praising the senator's "hard work" on issues from open space to public transportation. It notes "the presumption of innocence," adding that the politician looks "forward to the resolution of this matter so Senator Menendez can continue his work on behalf of the citizens of Hudson County and New Jersey." The Justice Department has been looking into whether, in exchange for the gifts, Menendez improperly lobbied U.S. officials to help Melgen with business matters. Two key issues include whether the senator improperly helped Melgen in Melgen’s efforts to secure a port security deal worth tens of millions of dollars, as well as helping the eye doctor with Medicare regulators looking into whether Melgen had overbilled Medicare. The expected criminal charges come as the confirmation of Loretta Lynch, the U.S. Attorney for the Eastern District of New York nominated by President Obama as U.S. Attorney General, hangs in the balance. Menendez has not yet said how he would vote. Washington insiders tell NBC 4 New York either a vote of yes from Menendez or Illinois Republican Sen. Mark Kirk is needed to get Lynch the 50 votes she needs to be confirmed.